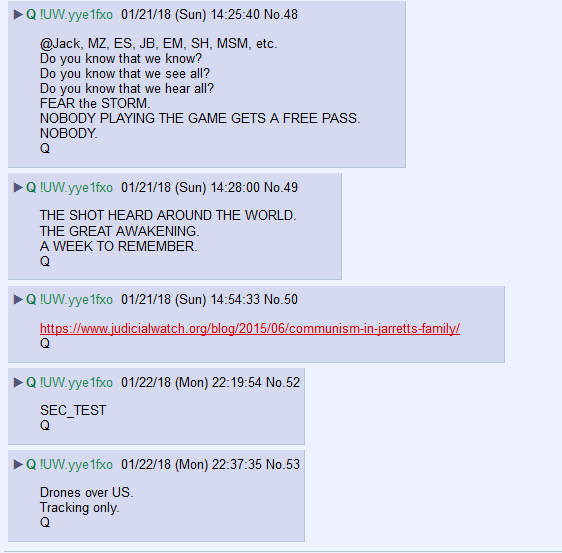 Site was attacked (DDOS) right after that first Q post. Coincidence? Maybe. Regarding "the memo", why would Republican Senators not be allowed to see it? I thought Senators wielded more power and authority than House members. Sen. Rand Paul, R-Ky., made an effort to gain access to the memo, but was rejected, his spokesman, Sergio Gor, confirmed to the Washington Examiner on Saturday. One other member of the upper chamber member, Senate Majority Whip John Cornyn, R-Texas, attempted to view the report, but was blocked. He did, however, receive a briefing on it from Nunes, according to CNN’s Manu Raju. Not sure. But there was some uptick in military aircraft activity last week, awacs, p3, other reconnaissance planes, across the continental US, might have something to do with it? Not sure this means anything. I was told by SME on military/aircraft forum many months ago that I lived on a "practice corridor" or "flight corridor" with much activity. Lately, like last 3 weeks, zip, zilch, nada. Coincidence- I don't think so. They had all day to mess with that site, but right after the post- bam. I'm sure there's some pissed off black hats out there that aren't getting what they want, and things aren't going their way. Pray it stays that way. Because the HIC only voted on release to the House. I'm sure it will make it's way to the Senate eventually. After all the hoopla, it had better be worth everyone's time. Thanks for that. Into the verse it went.